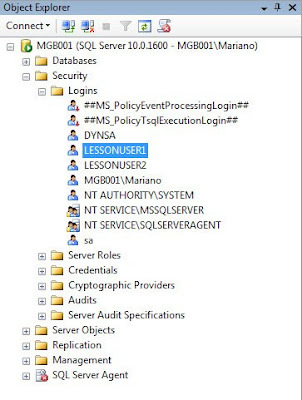 Since sa is a member of both the POWERUSER role in Dynamics GP and the sysadmin role in SQL Server, it can perform all maintenance operations of users in Dynamics GP, along with the setup of additional users. This allows the sa user login, in turn, to create the necessary logins in SQL Server. This is good if you are a DBA, but what happens when you are out and more users need to be added to the system. 1. Log into Microsoft Dynamics GP as sa. 2. 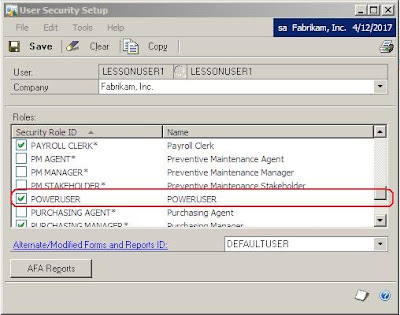 Assign the Dynamics GP user to the POWERUSER role. Go to Microsoft Dynamics GP > Tools > Setup > System > User Security. Choose the user login and mark the POWERUSER role in the access list. 3. The system will warn about the user access to all application functionality. Click on OK to continue. NOTE: Depending on your security requirements, you may not want to grant access to the POWERUSER role. You can always create a custom role with access to the User Setup window or use the built-in ADMIN_SYSTEM_001* role. 4. 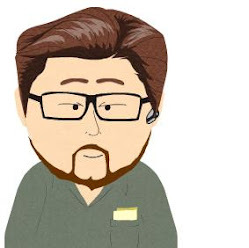 Now, proceed to assign the user login to the sysadmin role in SQL Server. Open Microsoft SQL Server Management Studio, open the Security folder, open the Logins subfolder. 5. 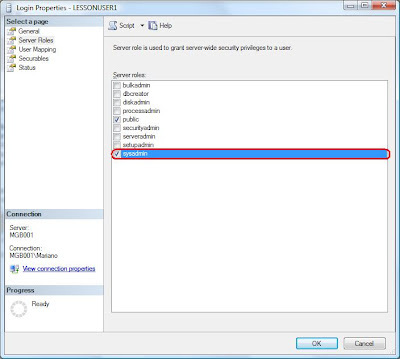 Double-click on the corresponding user login to open the Login Properties window. Select the Server Roles page and mark the sysadmin role. 6. Click the OK button to finalize the configuration. Now your Dynamics GP user should be able to setup new users and maintain existing ones, along with performing other SQL Server maintenance activities within the application. The Microsoft Dynamics GP Application Level Security Series. David Musgrave at Developing for Dynamics GP. Click here. Microsoft Dynamics GP Password Implementation. Click here. We are glad to see this knowledge providing blog post. Data deletion situation is generally an Inconvenience for the end user. So as to resolve this challenge, the gurus have launched several data files recovery options. If a removal of data issue has taken place, user has to know which tool or software to apply so as to handle this case of information loss.